Ji Eun used to be apart of YG Entertainment back in 2007 and was even a singing couch for Dara of 2NE1. Then in 2009, she debuted in female trio Lady Collection. Unfortunately, they weren’t that popular, but hopefully they’ll make a comeback. I don’t remember exactly when I heard 어제와 다른 오늘, but after one listen I had to find out who she was and what the name of the song was. I went through this period where I listened to this song for about 4 months on repeat. Rain is a slow tempo R&B track. I really love the way the verses and chorus are sang differently.Beautiful piano melody at the beginning of 한번만 말해. This song has a lighter feel and it isn’t quite a power ballad, but it has the power that a power ballad would have. I like this song; it’s not my favorite, but it’s pretty good. Compared to the previous songs, 선택 has a light, fun feel. This song is more R&B style and I like the incorporation of the violins and guitars. One Night Lover also follows in the more fun side. It’s a fun dance track that I find myself dancing to whenever I listen to it. I’m Sorry has that early millennium sound; very movie soundtrack sounding. This isn’t something that I would listen to, but it’s okay. 보고싶어요 is a really gorgeous ballad. This shows off her voice and it’s so relaxing. I had this on repeat for a while too. 빌려 드릴께요 is a slower song. I love the way Ji Eun sings the chorus with a sense of urgency, it really pulls you into the song. Love Is Over sets the mood right from the start. It’s melancholy and sad; Ji Eun can express this emotion well that I don’t even need to know what she’s saying to know what she’s talking about. 이별은 내게 흔하죠 is a bit lighter than the previous trio of ballads. I don’t really care for the song, nothing stands out about it and it’s kinda boring;I feel like I’ve heard this song before while listening to the album. I love, love, love the intro of 이제 그만해! Then this beat comes in and it’s totally unexpected,but it fits. These are the kind of songs I need her to sing. I think the album could’ve ended with that song, but it doesn’t. 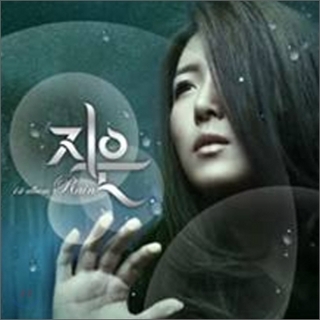 그녀와 나 사이 finishes off the album. I don’t know what it id about the song,but I don’t really like it as a whole. The break in the middle of the song is pretty cool how they incorporate a dial tone, but that’s about it. omg, i miss this girl. i was sad that she wasn’t a part of YGE no more and that YGE didn’t do anything with her either. but i found out about her in LC, but they didn’t go anywhere much either. anyways, i love Rain. both English and Korean versions are good, and her English really surprised me. but those are the only two songs I know of her, so thanks to you, i’m going to find the rest. C: thanks for sharing.